Facebook continues to pack features into its Messenger app, introducing polls and a chat assist function for payments. 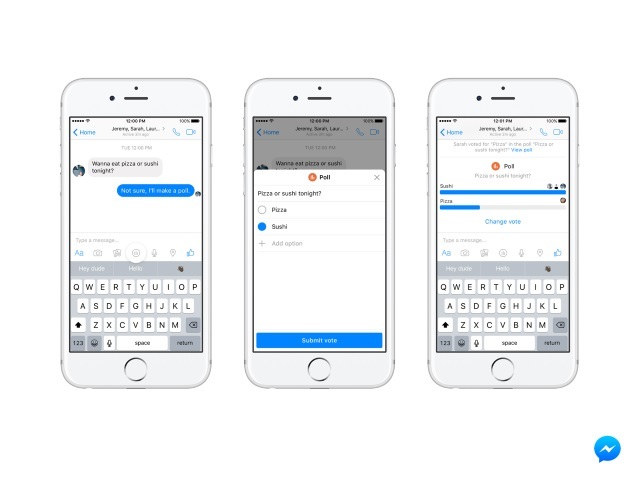 Facebook continues to pack features into its Messenger application, introducing polls and a chat assist function for payments. Today, we’re rolling out the ability for you to start a poll in a Messenger conversation. In a group conversation, just tap the Polls icon in the composer or tap More and select Poll. From there, you can add the question and specific answers for your friends to vote on and press submit. The poll will appear in the Messenger conversation, where your friends can easily vote. And Josh Constine of TechCrunch reported on the chat assist function for payments, saying that it uses machine learning to search for phrases such as, “IOU,” “You owe me” and “Send me,” after which it triggers the app to include a payment button below the message thread, which users can opt to click and send money by entering debit card information or using cards that have previously been linked to Messenger. We look at this chat assist function with polls and payments as just another example of offering help to make Messenger users’ lives easier, like offering a ride with Uber, for example. Readers: What are your thoughts on these new Messenger features? Screenshot of chat assist function courtesy of Josh Constine, TechCrunch.